Read more on NVMe RAID support coming to Threadripper. While I agree saying "very disappointing" is the wrong phrase I'd use, my issue with this is that NVMe raid is so useless that does it matter it's barely 3 months(if that?) Delay? I do not think so. The only thing we're it would benefit a person is when reading massive 4k/8k raw files in Premier and scrubbing timelines. Yes, because the only use of RAID is to get a speed boost. Yes because people will buy 2 very high TB NVMe drives and raid them in raid 1 because it's a cheap and sensible option. And to the ones that do? They can wait like they did. The whole 3 of them. Why delay a launch of over raid. I'm not exactly sure what your referring to so excuse me if I'm wrong. 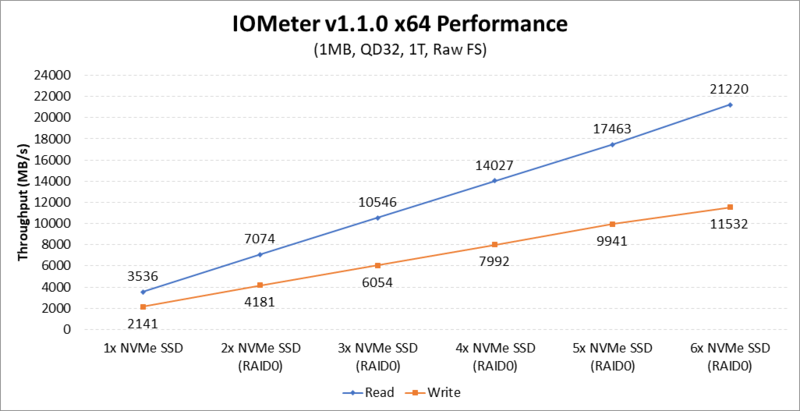 But I have been using NVMe raid on intel since around Z270 launch which was Jan 5. I did not have to pay intel for it I am using intel drives though as that is all that was available to me at the time. All I had to do was set up the array and load the raid drives prior to opsys install. I do raid 0 to get 2 drives spanned together making for a larger platform. I did NVMe raid 0 for epeen and to get a larger than 256 opsys drive. I agree speeds are not an issue once you go NVMe or even ssd for that matter lol. If a larger NVMe drive was available to me at the time I would of raided for a time to see raw performance then dropped it back to a single NVMe drive. It's nice to benchmark but it's honestly just useless. You don't want flash technology to be writing a lot and in a raid array they write more. Kills the drive faster. The problem with using RAID 0 on Z370, Z270 and older chipset, run the PCI-E interface for NVMe through the motherboard chipset and then to the CPU, through the DMI bus that only allow for a maximum bandwidth of 3,6GB/s. So a single Samsung 960Pro almost saturates the DMI bus to the CPU, so you can't take advantages of feeding the CPU with more data, when you expand to RAID 0, with a 960Evo og Pro at least. High-end enthusiast Intel and AMD motherboards fixes this, by allowing more PCI-e lanes on the CPU, and allowing NVMe to connect directly to the CPU, so you bypass the limit of the chipset and DMI. He was talking about x299. You need to pay for raid through PCI-e. You can still do raid on x299 if it's from the chipset. So Sata raid is still an option. However if you was using a pci-e card, either nVME or an SSD that plugs into the PCI-e slot then you would need to pay for raid. I have used raid 0 for years now. 9+ years just to increase the sizes of drives and speed. I however have never raided an SSD.